The clash of superheroes movie doesn’t come out until May 2016. That hasn’t stopped the Internet. Fans of Captain America and The Avengers franchise are awaiting Civil War with anticipation—so much so that any release of information is hotly debated and pictures are fast transformed. 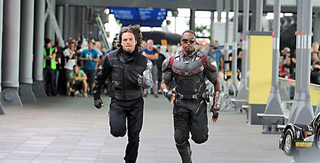 After Comicbookmovie.com posted an on-set snap of The Winter Soldier/Bucky Barnes (Sebastian Stan) and Falcon/Sam Wilson (Anthony Mackie) seemingly racing—each other? Away from danger? To save their pal Steve Rogers, a.k.a Cap?—social media had a field day setting the heroes to run amongst well-known backdrops. Captain America: Civil War is more than nine months away, but is already inspiring Internet hijinks. What’ll happen when we get an actual trailer? And where else should Bucky and Sam be running?